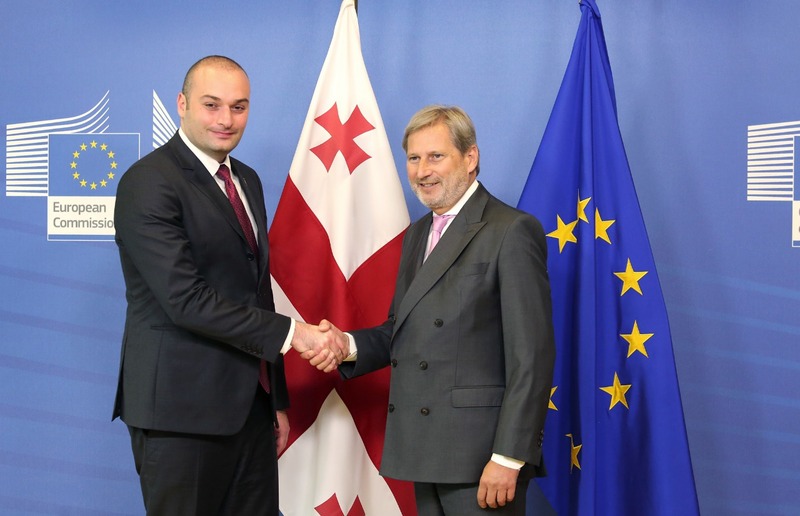 Mamuka Bakhtadze, Prime Minister of Georgia has had his first working visit to Brussels on July 18-20, 2018. Visit started with a meeting with Secretary General of the North Atlantic Treaty Alliance (NATO), followed with statements for media. Jens Stoltenberg reaffirmed of full support by NATO towards Euro-Atlantic aspirations of Georgia. Secretary General stressed the most significant role of Georgia in the NATO missions and operations, thereby praising the successful reforms implemented by the country. He also noted that work will be further continued to prepare Georgia for the accession to NATO. Jens Stoltenberg also spoke about the importance of joint NATO-Georgia trainings, Substantial NATO-Georgia Package (SNGP) and increased cooperation in the Black Sea basin. "NATO is united in its support towards security and territorial integrity of Georgia within the internationally recognized borders, which includes Abkhazia and South Ossetia. We call on Russia to withdraw its troops from your territory" stated the Secretary General at a joint conference. According to Mamuka Bakhtadze, new Government of Georgia remains solidly committed towards its accession to NATO. He stated that as a future member of the Alliance, Georgia will continue to contribute to the common Euro-Atlantic security. Head of the Government of Georgia expressed his gratitude to the solid position of the allies, calling on Russia to void the recognition of a so called "independence" of the occupied territories of Georgia and to withdraw its troops. 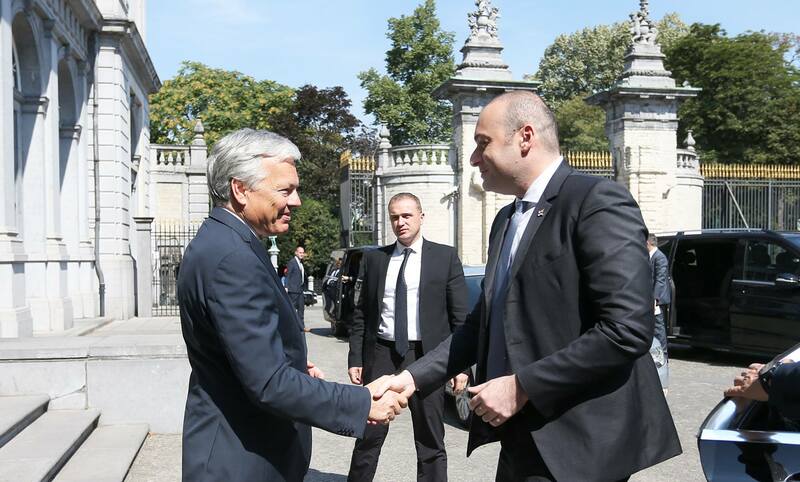 Prime Minister of Georgia met with Donald Tusk, President of the European Council after his meeting with Jens Stoltenberg. Parties discussed a wide array of topics and positive trend of current relations between the EU and Georgia, along with the prospects of future cooperation. 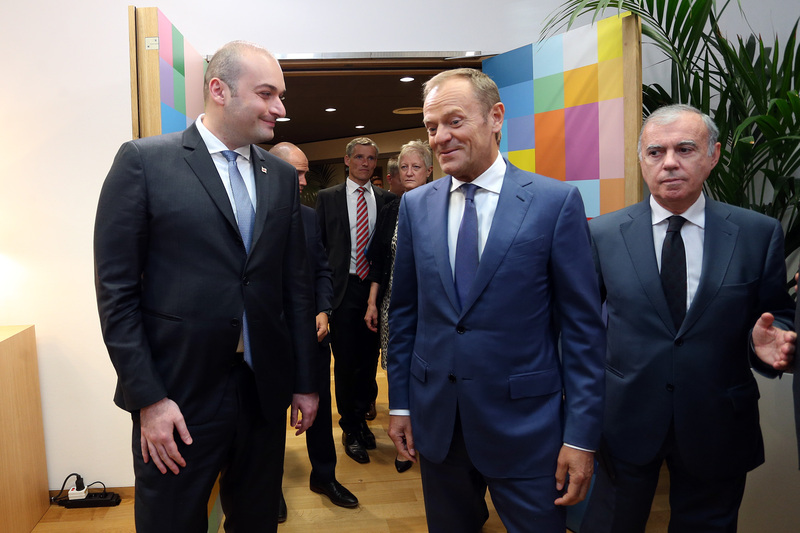 Mamuka Bakhtadze briefed the President of the European Council about the new government priorities and initiatives, which were positively viewed by Donald Tusk, who made a special focus on the economy. Meeting held at the European Council focused on the significant progress achieved by Georgia on its quest to European integration. Parties expressed hopes that successful reforms will facilitate a greater intensification of strategic partnership between EU and Georgia. "In line with the Association Agreement, including the Deep and Comprehensive Free Trade Area, we have implemented legislative and institutional system restructuring to approximate them with EU norms and standards. It led to the consolidation of reform initiatives of the Government towards democracy, good governance, rule of law and stability" noted the Prime Minister of Georgia at the press conference after the meeting. According to the Head of the Government of Georgia, role of EU is tremendous in the support of peace and stability in Georgia. "Solid position of EU and our international partners toward an unlawful policy of Russia and their effective engagement has a significant impact on ensuring the territorial integrity of Georgia within its internationally recognized borders. We remain strongly committed towards the peace policy. Government of Georgia makes explicit attempts to reconcile and build trust, as elaborated in our new peace-building initiative - Step Towards Better Future" noted the Prime Minister of Georgia. "We stand ready to further support you in the implementation of the program" stated Donald Tusk when addressing the Head of the Government of Georgia and reaffirmed him in the unshaken support of EU towards its territorial integrity and sovereignty. Within his first working visit to Brussels in the capacity of the Prime Minister of Georgia, Mamuka Bakhtadze held meetings with Didier Reynders, Deputy Prime Minister and Minister of Foreign Affairs of the Kingdom of Belgium and Valdis Dombrovskis, Vice President of the European Commission for the Euro and Social Dialogue, who has been invited to Georgia by Mamuka Bakhtadze. Success of the Government of Georgia on its way to the European integration has been praised at the meetings and readiness of close cooperation has been reaffirmed. EU fully supports reforms of the Government of Georgia, which are aimed at the facilitation of small and medium enterprises (SMEs), as noted by Johannes Hahn, European Commissioner for European Neighborhood Policy and Enlargement Negotiations while speaking with Mamuka Bakhtadze at their meeting. 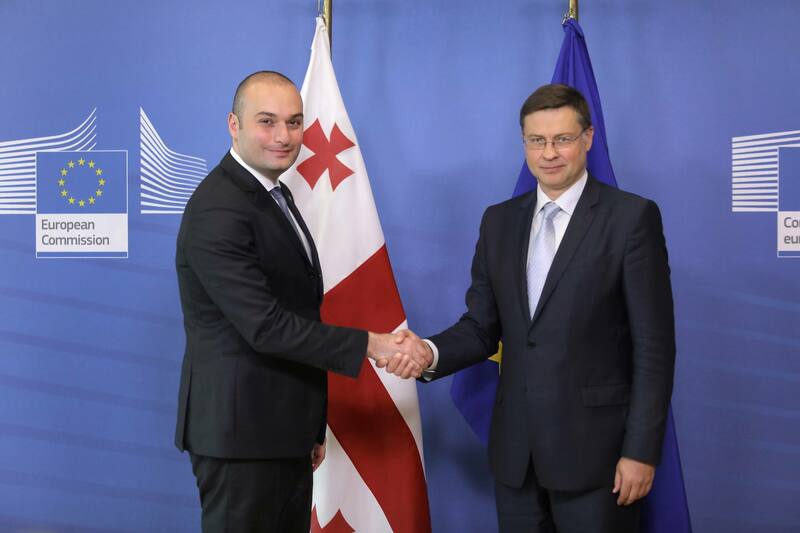 Head of the Government of Georgia and European Commissioner discussed the topics of European integration of Georgia, EU Association Agenda, Eastern Partnership format and visa liberalization issues. Hopes were expressed that steps made forward, along with the developed roadmap, which is aimed at a greater approximation with EU, will facilitate Georgia's return to a great European family. Also, discussions were related to the establishment of a European School in Tbilisi with its regional importance and magnitude, which was a personal initiative of Johannes Hahn and official launch of which is scheduled for the nearest future. Special focus was made on the fundamental reforms planned in the education system, implementation of which will facilitate the sustainable economic development and inclusive growth of the country in the opinion of the Prime Minister of Georgia. Delegation of Georgia, headed by the Prime Minister of the country, included David Zalkaliani, Minister of Foreign Affairs of Georgia; Levan Izoria, Minister of Defense of Georgia and Vakhtang Makharoblishvili, Deputy Minister of Foreign Affairs of Georgia.